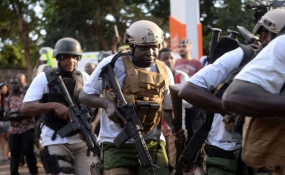 Security forces arrive at 14 Riverside Drive, which was attacked by suspected terrorists on January 15, 2019. Nairobi — Two key suspects were arrested Wednesday as detectives swung into action following the terror attack at the dusitD2 complex on 14 Riverside Drive. The attack left 14 people dead and scores injured. Director of Criminal Investigations George Kinoti said the suspects were arrested in Eastleigh and Ruaka where one of the attackers lived.